Not valid for patients enrolled in Medicare, Medicare Part D, or Medicaid. If you are using private or commercial insurance, get started below to see if you are eligible. If you’re delayed or denied treatment from your insurance provider, we may be able to help. Contact 877-CarePath (877-227-3728) and ask about the Janssen Link program. If you qualify for cost support, you may receive up to a full year of instant savings on your insurance co-pay, deductible, and co-insurance costs for SIMPONI®. Find out about cost support eligibility, requirements, and restrictions here or call 877-CarePath (877-227-3728) Monday – Friday, 8:00 am – 8:00 pm ET. The Welcome Pack is filled with tools and information to help you get off to a good start with SIMPONI®. SmartJect® Reusable Trainer—an empty autoinjector with no needle or medicine inside. You can use this to practice giving yourself injections. Treatment Preparation Mat—a smooth surface where you can lay out all your injection supplies. It’s printed with step-by-step instructions for using your autoinjector. This pack is designed to help you travel with SIMPONI®. The SIMPONI® Travel Pack helps you take your medicine on the road. It holds your autoinjector or prefilled syringe, so the medicine stays cold and protected from the light. When you reach your destination, store your SIMPONI® medication until you're ready to use it. Follow the storage directions in the Medication Guide that comes with your medication. Information on using the Travel Pack appears on the Travel Advisory Card that comes with the pack. If you’re traveling by plane, have your doctor complete and sign this card. It lets security agents know that you are allowed to carry your SIMPONI® on the plane. Keep your SIMPONI® Travel Pack and Travel Advisory Card with your carry-on items so they will be handy when you need them. Order now or call 877-CarePath (877-227-3728) Monday – Friday, 8:00 am – 8:00 pm ET. 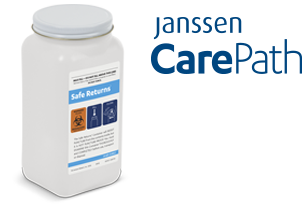 Safe Returns® is a safe and simple mail-back service to dispose of used injection devices—at no cost to you. disposal container in the mail. device into the container after injecting. 8:00 am – 8:00 pm to request a Replacement Pack. The information you provide will be used by Janssen Biotech, Inc., our affiliates, and our service providers, for your enrollment and participation in the SIMPONI® Safe Returns® program, and for any program options you may select. You may withdraw from the program by visiting Safe Returns and checking opt-out in the Safe Returns® Program Options. The information you provide will be used by Janssen Biotech, Inc., our affiliates, and our service providers, for your enrollment and participation in the SIMPONI® Safe Returns® program, and for any program options you may select. You may withdraw from the program by clicking Unsubscribe. We make it easy to get answers from a nurse, from the comfort of your home. Janssen Nurse Support offers assistance in Spanish. El soporte de enfermería de Janssen ofrece asistencia en español. I am new to the program and need a starter pack. I would like to opt out of the Safe Returns® program. Yes, I would also like to be contacted about new SIMPONI® market research programs. I would like to opt out of the Safe Returns® program. Please send me a mail-back box, but no new replacement pack.